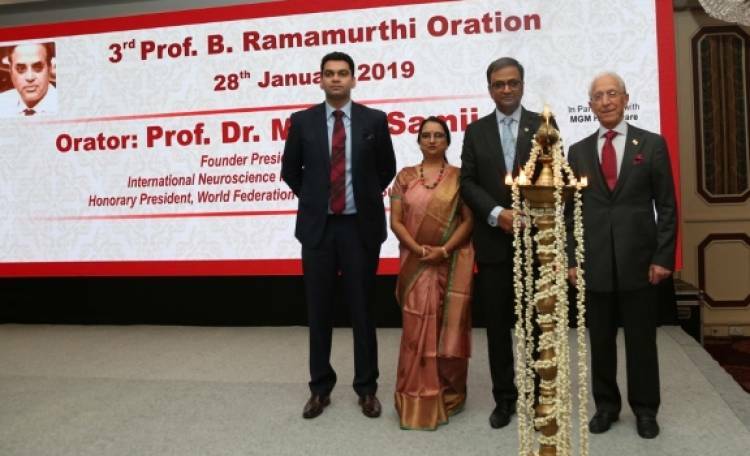 Chennai 28th January 2019: The 3rd Prof B Ramamurthi Oration was organized by the Advanced Neuroscience Foundation Trust in partnership with MGM Healthcare, on 28th January 2019. On this occasion, Prof Dr Madjid Samii, Founder President of the International Neuroscience Institute, Hannover Germany and Hony President, World Federation of Neurological Surgeons delivered the Oration which was attended by around 200 eminent neuroscientists of the city and members of the society. Prof B Ramamurthi was a pioneer neurosurgeon and neuroscientist of the country, who was responsible for starting the Institute of Neurology at the Govt General Hospital in 1950 and the first Head Injury Ward in the country in 1967. His life and work were showcased in a short film “Guru Samarpanam”, produced by Dr K Sridhar. “Technological advancements have changed brain surgery and its outcomes for the better” said Prof Dr Madjid Samii, while speaking of the changes in brain surgery over the last few decades. He also mentioned that thanks to this, patients do better and their lives change for the better. A patient awareness booklet “Your Health Handbook” on Brain Tumours by Dr K Sridhar was released during the function. The handbook served to create a basic awareness amongst the public on the various aspects of Brain Tumours. The Advanced Neuroscience Foundation Trust has been started with the prime objective of spreading awareness regarding Neuroscience related health issues among all sections of society. This we hope will prevent those health issues that are preventable, and help early alleviation of neurological related health problems.